I couldn’t have been happier with my JetBoil Sol. At 10.5 ounces (without the canister), this little guy boiled two cups of water in about two minutes, taking sips of fuel as tiny as a Baptist debutante with her first wine-spritzer. If you would like to shave two more ounces off (at a mere $15 per ounce), there is also a titanium version that comes in at 8.5 ounces. Second, the igniter at the base actually works, 100% of the time. I never once had to light it with a match or lighter. Third, it comes with just about everything you need. There is a tiny stabilizer that fits on the bottom of the canister (which you might not need, but I carried since the fire danger was so high in the Sierra). It has its own cozy, which does a great job, and it even comes with an adapter so you can use a regular pan on it (although I left that at home). I used the stove once or twice a day to reconstitute freeze-dried meals. I carried two brands: Mountain House (which were tasty, tasty, tasty) and Wise Company (which were not, not, not). I know there are lots of other freeze-dried and dehydrated alternatives out there, and I’ll be interested in hearing about people’s favorites in the comments. A couple of other lessons I learned along the way: first, instead of carrying all your meals in the foil cooking bags, consider carrying just one cooking bag and reusing it every meal. (You can replace it at every resupply point.) Take the other meals out of their bags and store each in a small paper bag. Then, as you use the portion, either burn the bag or fold it up small and carry it out. Second, have you ever noticed that little hiss of gas that occurs when you screw the canister on or off the burner? One might be tempted to leave the canister connected, between meals, in order to avoid losing any gas. That turns out to be a bad idea. I met a very experienced and savvy hiker who tried leaving the stove assembled, and it drained his canister completely. Go ahead and remove the canister each time you use it. Weight savings: none. My JetBoil Sol is a terrific choice, although, if I can get a decent price for it used, I may upgrade to the titanium version. After all, two ounces is two ounces! Grade for my choice this trip: A. Although I do like a few of the meals Mountain House offers, (and agree with your assessment of the Wise food) I have found that the best dehydrated food comes from my own kitchen. I have found that Spaghetti, actually tastes better after being dehydrated, (the dehydration process intensified the flavor of the sauce) and that it’s really surprising just how many tasty meals you can make with an inexpensive dehydrator. As a bonus, anything you don’t use on the trip can be used on those days when you just can’t think of anything to make for dinner. My last hike, I feasted on incredibly awesome Spaghetti, (this turned out to be one of the favorites), Chicken Ala King, Hungarian Ghoulash, Beef Stroganoff, Chili, Beef Stew, Cajun Beans and Rice, Chicken with Curried Rice, Mac and Cheese and Turkey with Stuffing….and every single one was cooked in my own kitchen, to my own taste. Give it a try sometime! Do-it-yourself dehydrating sounds great and I can’t wait to give it a try — after I retire and move near the Sierra Nevada. Thanks for the comment! Great review and I’ve heard nothing but accolades for the jet boil. We finally figured out what you mentioned–repackaged commercial freeze dried foods except the first one you use and repackage. I did find that it occasionally will fail so I might bring a second bag or Opsak as a backup. I enjoy both Mountain House and Backpackers Pantry freeze dried dinners. I also love what I dehydrate at home so we alternate between home cooked/dehydrated and commercial for more variety. Thanks for the info! A back-up bag is a great idea, although you can just use the actual “pot” that comes with the Jetboil if necessary. Of course, that would then require cleaning! Thanks! When dehydrating your own meals, am I correct in assuming that in order to figure how much water to add in the field, you just measure the weight of the ready to eat meal prior to dehydrating and then reweigh the meal after dehydrating to get the weight difference and it is that number that is the amount of water to add in the field? Am I missing anything? I’ve been hiking and backpacking my entire life, but have never dehydrated my own food for the trail, so that would be new to me. Thanks for all your input into all aspects of hiking. Good question, Mike. I’m afraid that I haven’t yet tried dehydrating my own meals. My [uninformed] suggestion would be to experiment at home, prior to the hike, and come up with the proper formula. Good luck and thanks for the comment. I agree with geekgirl, MH is easy but expensive. Making your own is the way to go, especially if you want to know exactly what you are eating. I packaged my homemade meals in vacuum bags that were rated for high temps so I could rehydrate right in the bag and not get my pot dirty. So many people are suggesting do-it-yourself that I might have to try it. Thanks, Darren! If you are weight concious look at the Sno-peak Giga stove — 3.5 oz. It will fit in it’s own pot, 1/3 the size and 1/2 the price. My daughter & I each carried our own and then sampled two dishes each night. Thanks, Darryl. I note for ten dollars more you can get a titanium model that is even lighter. Very cool! This spring I tried upgrading to the titanium GigaPower to save even more weight, but something odd happened the first time I used the titanium model – it lit normally but the flame sputtered and went out after about two minutes. The same thing happened when I tried it again. I transferred the fuel canister (there was plenty of fuel left) to my old GigaPower and that worked fine, so the problem wasn’t the fuel. I returned the titanium model and stuck with my old regular GigaPower for my 8-day trip. I don’t know if there is a design flaw with the titanium or if I just got a defective one, but I decided not to risk it again. Thanks, Gail. Interesting experience with the titanium model. When thinking about the extra cost of the Titanium version, consider what JetBoil used to say about titanium before they started selling a TI version: “Why is aluminum the best material for cookware? and scorches food easily because it is a poor distributor of heat.” From their old product catalog.” I have the JetBoil PCS (older version of the Sol) and love it. I bring a spare piezo (sparker element) as it was a weak point on the PCS and the extra weight is minimal. My fuel consumption rate is less than 5 grams per cooked meal and I my typical meal involves 2 cups of boiled water. I would take a 110 gram (net weight) canister for up to 12 days of backpacking. If you have coffee or tea, you’d burn more fuel. PS: I was the idiot (aka “very experienced and savvy hiker”) who didn’t unscrew his canister and had it leak all the way to empty one day (a friend gave me his spare). I supplement it with a 8-oz plastic jar with it’s own DIY cozy for steeping things (like tortellini) that otherwise would require a longish simmer. The jar-cozy combination also allows me to hold 1 cup of dinner, after it is cooked, and keep it hot. I find on a big, high calorie dinner it is often hard to eat the whole thing before it gets cold. the jar-cozy allows me to eat the firts 2.3 of dinner and return 30 minnnuts later to finish the rest without it going all nasty. Thanks, John. I was unaware of what you describe about titanium. Interesting point, although (at least as I hike, now) I only use the “pot” to boil water, so, presumably the heat distribution would be less of an issue. Perhaps I’ll save some money, keep what I have, and spend that on other stuff! And you’re still “savvy” to me! Thanks for the report. I’ve always known (from John Ladd) that the JetBoil was the most efficient canister stove you could find but I’ve always shied away because of the weight penalty. I think it would take 10 days to break even. That’s no longer a problem now though since 8.5 oz is getting down close enough to compete with discrete stove/pot setups. Thanks for the comment, Larry. I really liked this stove. I didn’t even mention in my initial post how FAST it is. Even at Guitar Lake it took less than 2.5 minutes to boil two cups. We also are sold on the Jetboil–my first backpack trip was probably 8 years ago and hubby’s old whisper lite stove had issues…or maybe the matches had issue, I don’t remember but that led to no coffee…which led to a not so happy wife. BUT I still LOVE backpacking 🙂 So I went out & bought a JetBoil right away. It’s so old, I have no idea how it compares to what is on the market these days. The piezo ignitor broke right before the trip so we replaced it…and on night 7 I couldn’t get it lit and noticed that the part that sparks was gone. It broke right off…so we used it the rest of the trip with a lighter–John Ladd offered us his back up peizo but the lighter worked perfectly. We had decided we were gonna buy a new Jetboil with the next REI discount but decided against a new one since this one works so good with the lighter! P.S. I bought a few of the new Sierra Trail Mix Clif bars…they are pretty yummy. Great story, Tammy. I, too, believe in having a happy wife on the trail (see: http://jmtbook.com/john-muir-trail-hiking-the-trail-with-your-spouse/). I’ll have to try the new Sierra Trail Mix flavor. I did forget to mention that I have the Titanium JetBoil. I bought it after I couldn’t get a couple of cups to boil at Trail Camp in less than 20 minutes. Even at 12,000 feet, the JetBoil does the job in under 3 minutes, and is very consistent. I also had the aluminum version, and although I never conducted any tests, I haven’t really noticed any performance differences between the two. I have the Jetboil Sol Ti. Interestingly, my piezo works fine at sea level, but rarely works above 5,000 ft. I’ve spent considerable time tweaking the spark gap, to no avail. The Jetboil Sol Ti and one 4 oz canister (replaced once at Red’s, and once at MTR) was more than enough fuel for two of us for the entire trail. Not bad, weight-wise, about 12.5 oz – 16.5 oz for stove, fuel, and pot (depending on how much fuel is left!) for two. Given the fire restrictions this year, I agree with your “A” on the Jet Boil. Even without the fire restrictions, it’s not clear to me there’s a better choice, even for an infrequent-boiler such as myself. I haven’t tried alcohol or Esbit yet, but those are probably in the running, if you don’t cook frequently. 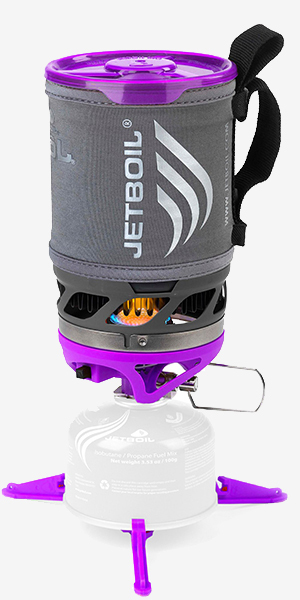 Where along the JMT is JetBoil fuel canisters sold? You MAY be able to get ones at Tuolumne Meadow, Red’s Meadow and Muir Trail Ranch, but I wouldn’t depend on it. Better idea is to ship them in your resupply buckets. That must be, by the way, ground shipping due to their flammable nature. I used the above mentioned Snow Peak gigapower butane stove for the JMT. It performed excellently. I’m already planning for a 2014 trip. This year, I’ll bring the same veteran stove, but also an Evernew 1.3L titanium pot. The wider pot gives me some hope of making quesadillas with tortillas, cheese, pepparonies, and Tabasco. The Mountain House freeze drieds tasted good. That brand is a winner. “Real” food tastes even better, and is better for you, tho. If your back won’t tolerate the weight of real food, either get in better shape, or settle for Mountain House. If you pay a young, strong guy’s way, he might carry a little of the good stuff for you. Real food is definitely a tastier way to go. Thanks for the comment! I have used both the jet boil as well as the snow peak lite max titanium. I also do some home made meals which sometimes require actual cooking of of the meals in the pot, in which case the jet boil is just not an option (burns far too easily even on low). when i do use freeze dried only, i tend to go with the jet boil (so much easier and faster). This is a great point, Ryan. I often “hike-by-objective” and do not spend the time to do any real cooking. During my first thru-hike I didn’t even bring a stove. I am going to retire in a couple of years and one of the skills I hope to gain (as you already have) is to be able to prepare a decent meal at a campsite. Thanks for the comment! Tasty alternatives to the usual MH selections. Cheers!